FILE - The Syrian Democratic Council meets in Tabqa, Syria, July 16, 2018. One key subject the SDC is said to be focusing on during the discussions is a proclamation named Decree 107, which Syrian President Bashar al-Assad issued in 2011, months after the protests began. The order reinforces the rule of the central government by tying all districts and provinces to a central authority in Damascus, an arrangement ethnic Kurds oppose. "The 107 Decree falls short and does not achieve anything for the democratization and decentralization of government. We have experience in governing our areas in Syria, and we see that this might be a model for future Syria," Riad Darar, co-chairman of the SDC, told VOA. FILE - Riad Darar, co-chairman of the Syrian Democratic Council, is seen during a council meeting in Tabqa, Syria, July 16, 2018. "Guarantees have not come from Damascus, but after trust-building and a willingness to talk about how the institutions will be run together and serve people, we can start to say this agreement will result in more comprehensive meetings in the future," Darar said. The initial negotiations between the Syrian regime and the Kurds came during the signing of an agreement in July to cooperate on the management of the Tabqa Dam on the Euphrates River. It provides electricity and water to the city of Tabqa, an SDF stronghold in eastern Syria. IS captured the Tabqa Dam in 2014; the SDF freed it in May 2017. During the liberation, the dam was partly damaged as the result of fierce fighting between warring factions and the coalition airstrikes. After the liberation of the area, the U.S.-led coalition helped SDF reconstruct the dam and make it operational. FILE - This photo released March 27, 2017, by the official Twitter account of Operation Inherent Resolve shows the Tabqa Dam, in Raqqa, Syria. Some analysts see the move by the SDC as part of a larger plan to ingrain the Kurdish identity within the country's constitution and extend constitutional guarantees to all ethnic groups living in Syria. The SDC proposal "aims to restore a national identity to the Syrian army and dismantle its loyalty only to the regime, distribute political and administrative authorities to all areas, and recognize the Kurdish identity in the constitution," Ferhad Hemmi, a Germany-based Kurdish journalist and analyst, told VOA. 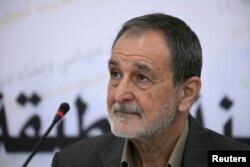 The Assad regime "cannot accept the concept of federalism or even the concept of decentralization, because the Baath regime represents the bigger section of the Arab nation in Syria," Heras said, adding that a decentralized Syria would be a good move for various parties involved in Syria, including the U.S.
"For the U.S., this will allow its forces to remain in Syria in order to build post-IS stability and at the geopolitical level to keep an observer force in place to try to limit the influence of Iran," he added. 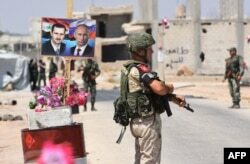 FILE - Members of Russian and Syrian forces stand guard near posters of Syrian President Bashar al-Assad and his Russian counterpart, Vladimir Putin, at the Abu Duhur crossing on the eastern edge of Idlib province, Aug. 20, 2018. The Assad regime, however, is adamant about keeping the status quo and has opposed any attempt to change the current system of government in the country, including Russia's proposed solution. "Since 2012, the local administrative governance has come through the support and the training of the coalition, and the security and structure of the Kurdish areas are being made able to withstand pressure from Damascus," Heras said. "One-third of respondents who opposed administrative decentralization may have done so out of wanting to keep the country united, especially in light of certain calls and practices that many fear were targeted toward division," the survey said.